Situated in Alrode, South East of Johannesburg, South Africa, this family owned and run business was named after the spectacular four kilometre high Eiger mountain in Switzerland, with it's actual silhouette illustrated in our logo. 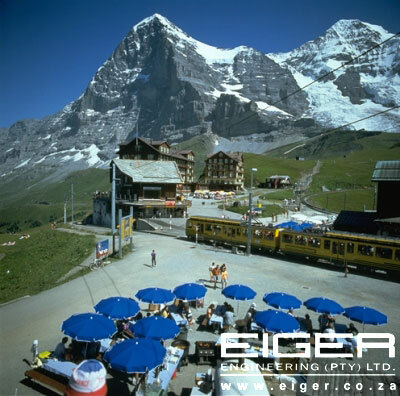 Eiger Engineering is headed-up by its Swiss Managing Director, imparting "Swiss Perfection" throughout the organisation! Customers are assured of hands-on family involvement in every department striving for superior customer service and personal attention at all times. Eiger Engineering invested in its first laser cutting machine in 1994. The demand grew rapidly from a broad range of industries requiring high precision laser cutting of components, etc. In 2003, a second larger laser cutting machine was purchased to run in conjunction with the first. In 2013, our newest machine was purchased. Over the years, various upgrades and regular servicing has been done to all machines keeping them at the forefront of technology and innovation ensuring our customers receive the very best in laser cutting. Other services offered usually in conjunction with customer's laser cutting requirements include, SHEETMETAL FABRICATION, CNC BENDING, ROLLING and/or GUILLOTINING of material, POWDER COATING at our on-site plant. We have been serving the maize and flour milling industry proudly since 1978. Our experience and reputation for manufacturing a large range of gravity mill spouting, equipment and machinery has enabled us to supply mills throughout the country and export into Africa and off the continent as far as the Americas, Far East, etc. Samples of our work have been requested world-wide, with outstanding reports received on the quality. Our standard stock spouting range is made from 1 to 2mm mild steel (depending on the item), which is then powder coated at our on-site plant keeping prices competitive. These items can usually be couriered, shipped or collected within a day or two. Most mill spouting can be manufactured in stainless steel if required which is suitable for wet conditions. Eiger Engineering's technical expertise can also assist with many other milling requirements. We are always looking to meet new people with skills that could benefit our team! If you think we should meet you, please Contact Us with more details. We'll keep your CV in our Human Resource system for any existing or future opportunities.